Perhaps when you think of the song of the summer, you think of The Beatles (“Get Back,” 1969), Whitney Houston (“I Wanna Dance with Somebody,” 1987), or Carly Rae Jepsen (of course, the still fresh “Call Me Maybe,” 2012). In the Canaan Valley, however, most radio frequencies do not reach us, so I cannot advise you on 2018’s Billboard hits. That does not mean that we are without culture here at camp. Merrowvista is always full of singing, ukulele and guitar playing, rhythmic table banging, as well as popular hits preserved on CDs and carefully curated playlists. And while we do not have the industry standard music chart to rate which songs are the summer’s best, Candlelight Sing is a great place to find the pulse of camp song popularity for the summer. Of course you already know that Candlelight Sing is the last evening activity of the camp session, where all groups gather around a campfire at the waterfront (weather allowing). Each group leads a song and the camp staff reminds them of all their great accomplishments over their session as well as the way they lived their lives with intention. It’s a really special evening, which we’ve written about before here and here, so instead of trying to capture all that sentiment I’d like to focus on the songs of our summer. The “setlist” for Candle Light Sing is created by the campers, as each group picks a song that’s special to them. They discuss various options as a group and then sign up for the one song they want to lead on a giant flip chart paper on the Farm House Porch. Some songs are rowdy. Mahoosuc will be singing “Rattlin’ Bog,” and Sentinel will be singing “Music Condor.” These up beat and high energy songs are often on heavy rotation in the eating lodge where groups can “song challenge” each other after meals. There’s no better way to digest a salad and a sub than to stand up and sing a little repeat after me song! But meals aren’t the only time we shake, rattle, and roll to a rowdy number. Villages also use these refrains to pump themselves up while hiking or after climbing to the top of a high ropes course challenge. Like “Great Big Moose” and “Yogi-Bear”, these are not only repeat-after-me songs, but often do-as-I-do songs. They make for a great morning wake up or afternoon shake out when the weather gets chilly as well. Songs will slow down as the evening progresses. There are always a few pop songs that make the Candlelight Sing set list, and this year groups have signed up for numbers like Katahdin will be signing “How Far I’ll Go” from Disney’s Moana, Carter Dome will sing “Upside Down,” by Jack Johnson, Flag will sing Beyonce’s version of “Ave Maria,” and Madison will be singing none other than “Rocket Man,” by Elton John. Even without the help of the radio, camp loves a catchy tune. Imagine your camper singing blissfully from the back seat of a 15 passenger van as they return from their successful camping trip, or holding a scrub brush like a microphone while they rock out in the dishroom during “arlos” scrubbing the community’s cutlery. Singing these hits at Candlelight Sing gets the whole community dancing and clapping along. It’s a sweet way to link the world of camp to the world that campers will return to very soon. Then, with the evening winding down, groups will turn to softer songs. These may be camp classics that villages have sung around a campfire on trail or while closing out an Evening Reflection in the chapel, like “On the Loose,” or they may be songs that try to captures the bittersweet sentiment of saying goodbye. Odyssey B will be singing “Rivers and Roads,” by The Head and The Heart, Liberty will be singing “Photograph,” by Ed Sheeran, and Voyageur C will be singing “This will be our year,” by the Zombies. 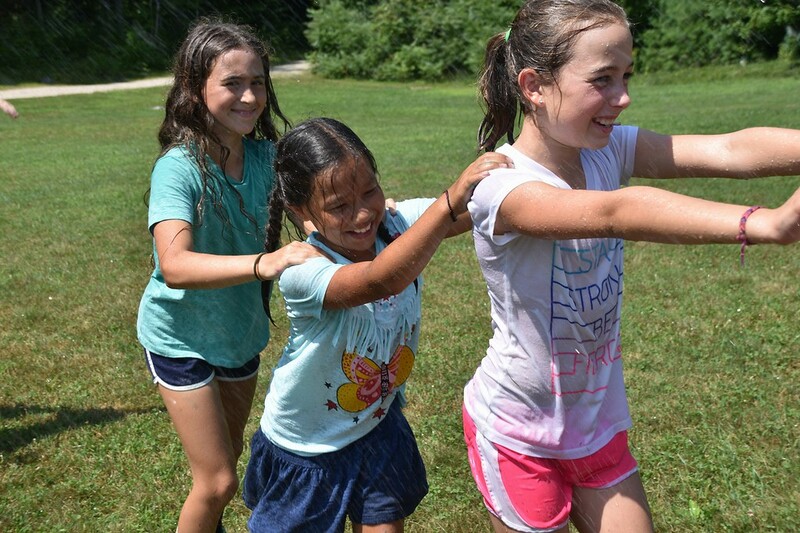 Even though living in community is hard, and the challenges and achievements of daily camp life can be difficult, it’s a magical way to spend a few summer weeks. The intensity of trail life and the shared joy of summer camp create deep friendships that will be hard to part from. The songs we choose to share at Candlelight Sing can capture that intensity, joy, and sadness in a way that is particular and special to the village leading the song, but that everyone around the fire will recognize and relate to. There are songs we shared together over the summer that won’t make an appearance at Candlelight Sing. Every group that leaves for an overnight (or longer) on trail gets serenaded with “Aloha” to let them know they’ll be missed back in the dining hall while they’re gone, and we sing to ring in the announcements at meals and the various skits and games that happen during Assembly. Just like gathering in circles, name games, and sunbutter, summer camp is synonymous with group singing. Studies have shown that singing together improves our mood. It makes us breathe deeper and relaxes us. It’s not just the act of singing, these effects are more pronounced when we join our voices with others. When we sing together, we feel connected, it gives us a sense of belonging. By singing with each other we affirm that each of us has intrinsic value, that we each bring something important to the community, and together we can accomplish something great. Of course, we try to arm campers with these tools and this knowledge in all things we do at camp. Group singing, and Candlelight Sing in particular, is just one glorious celebration of all that we aspire to be as a community. I hope that, if you’re joining us tomorrow for Grand Council, you join your voice with ours when the opportunity presents itself (and you know that it will). Or at the very least that you listen closely to the songs we sing to each other. There will be the song staff sings to campers, letting them know how proud we are of what we saw in them this summer and how full of hope we feel for the gifts they bring to the world. There will be the song campers sing as they exit the council circle, acknowledging that it is an honor and duty to give this life our best effort and to approach each other with love. There is the song we’ll sing to close out the council circle, slowly moving from a full community of voices, to the simple sound of one voice. We try to carry the magic that empowers us here, when we are together, throughout the entire year when we are far apart. And, with any luck, we find people in our home towns and at our schools and places of work that are willing to put themselves out there and sing with us.